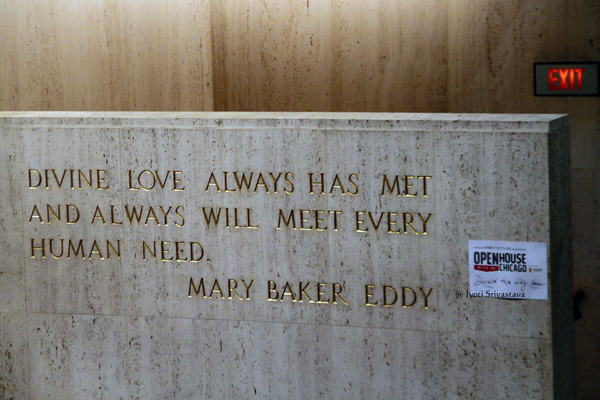 Location: 55 East Wacker Drive, at Wabash Avenue; Chicago. Designed by noted Chicago-based architect Harry Weese. Official website, Seventeenth Church of Christ, Scientist in Chicago..click here..
Seventeenth Church of Christ, Scientist is a part of a worldwide denomination with deep roots in early Christianity. Founded by Mary Baker Eddy in 1879, the Church of Christ, Scientist is designed “to commemorate the word and works of our Master” and “reinstate primitive Christianity and its lost element of healing.” Christian Scientists acknowledge one, infinite God who is All and all-good. The church is devoted to the spiritual development of society through worship, spiritual education and service. There are over 1700 churches around the world, in more than 75 countries. The community at Seventeenth Church of Christ, Scientist in Chicago first gathered in 1924. 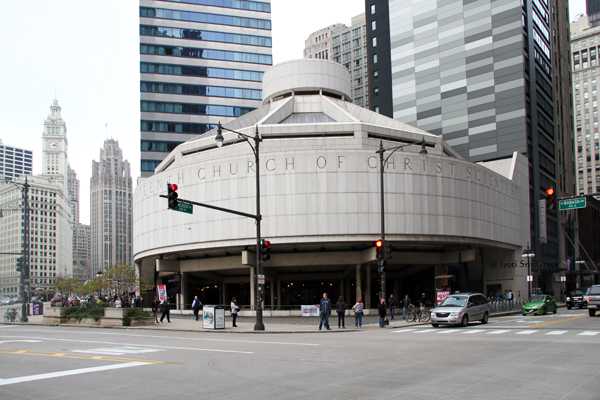 Meeting in various locations during four decades, including Orchestra Hall, the congregation built its first permanent home in 1968 at our current location on the corner of Wabash and Wacker in downtown Chicago. Seventeenth Church of Christ, Scientist / Chicago. 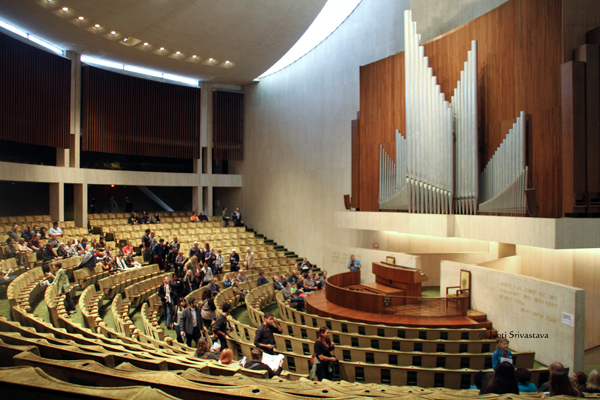 The Seventeenth Church’s building is designed by Chicago architect Harry Weese. 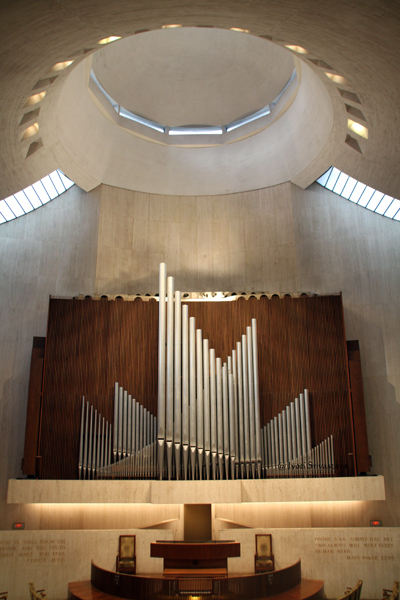 The Church’s iconic structure was designed to maximize a six-sided site at the intersection of three major streets. 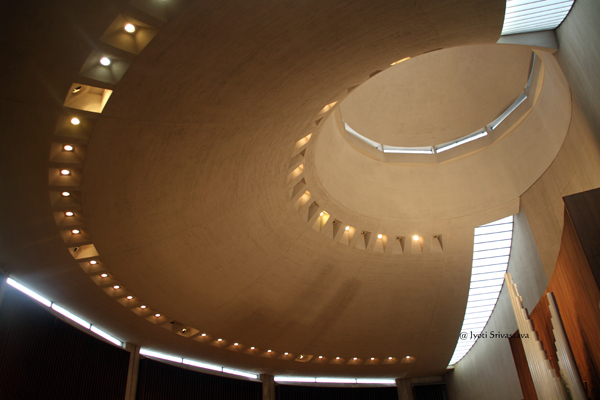 The structure is comprised of seven levels, with the main auditorium situated on levels four and five. The primary entrances to the church are at grade level, which actually is level three of the structure. The first level of the structure, accessible from Lower Wacker Drive, houses mechanical space and limited parking. Second level has Sunday School and nursery rooms [below the lobby]. Third level has the primary entrance to the church. Fourth and the Fifth level have the main auditorium building. Level four to seven have Church offices and other smaller meeting rooms. The roof of the auditorium can be accessed from the seventh floor, offering spectacular views of the City looking west down the Chicago River! A feature of the lower lobby is an acrylic painting on canvas entitled “Millenium Garden: Psalm 23,” completed by Chicago artist Anne Farley Gaines in 2001. The Church’s auditorium is at the fourth and fifth level. 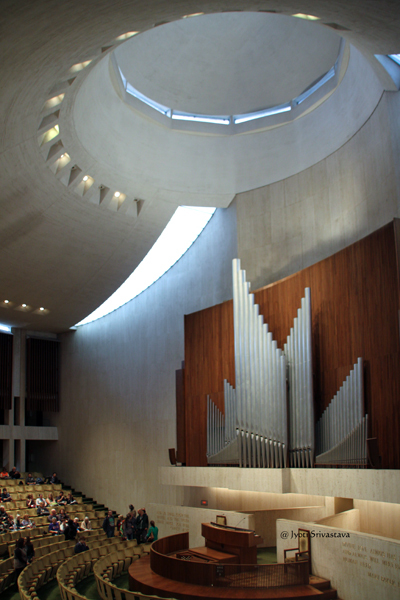 It is styled after the layout of a Greek amphitheater, and captures the democratic spirit of the congregation. 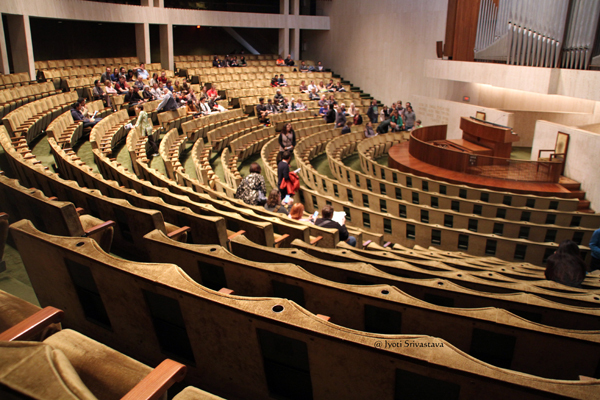 The semicircular auditorium which seats 764 is designed so that no seat is more than 54 feet from the Readers’ Platform, which is the focal point of all Christian Science church auditoriums. An invisible sound reinforcement system with 350 hidden microphones allows those in attendance at the Wednesday evening testimonial meetings to give testimonies without having to leave their seat. The church building has no windows to reduce street noise. However, The auditorium is filled with natural lights coming from the oculus and a pair of skylights and several narrow slotted opening between the back wall and ceiling. 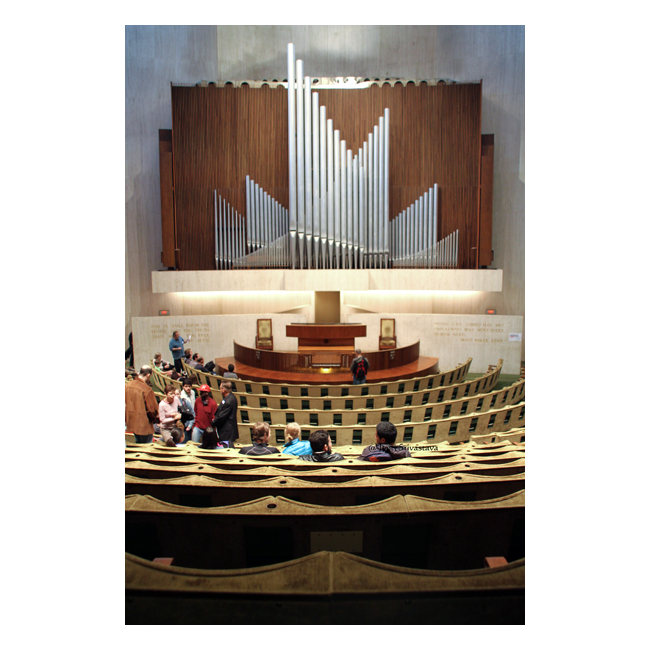 The travertine marble walls and wood podium in the auditorium are absent of traditional religious symbols, focusing attention on two sacred texts engraved into the travertine wing walls on each side of the podium. An excellent article by Matt Crawford.. click here..